I hate writing apology letters. I hate them. It’s not that I don’t know how to write. I don’t think this blog would be around for four years now without me having a little bit of skill in that department. I grew up in a family of individuals who prided themselves on always being right. Well… not just being right, but making sure everybody knew how right/smart you were and how wrong/dumb everybody else was. What started in my adolescence as little arguments with my sister about music, or with my dad about politics, has stayed with me into adulthood. My first instinct, always, it to make sure everyone knows that I am right, and everyone else is wrong. The reality is that I am wrong all the time. Everyone is. For the most part, when I am wrong I do a great job of hiding it. So when it comes to apologizing for something, that’s when I have real trouble. To apologize, by definition, is to admit to being wrong… so please understand how hard this is for me. Last August, Toby from Fineman PR contacted me to see if I would like to review the 2012 Faust Napa Valley Cabernet Sauvignon. The exact same day, I told Toby that I would love to review it, and to please send it as soon as possible. Faust had been on my radar for a while, and I was very excited to be given an opportunity to taste it… for free. The sample arrived within a week. I tasted, enjoyed, and made notes on the wine within another week of receiving it. And then I spaced out. I just totally forgot to post my review on this blog. In February (7 months later), Toby wrote me again to follow-up on whether or not I had tasted the wine, and when I was planning on putting the review up on the blog. That same day, I replied to Toby that I had forgotten to finish the write-up, and would be posting it really soon. Toby thanked me for being so quick to respond. At the end of April (nearly 3 months after Toby’s initial follow-up, and 10 months after receiving the sample), Toby wrote me again to see if I had gotten around to posting my review. I wrote back to Toby with a bunch of excuses, but the reality is that there was no excuse. Now here I am on the last day of June, having tasted your wine almost 11 months ago, finally posting my review. 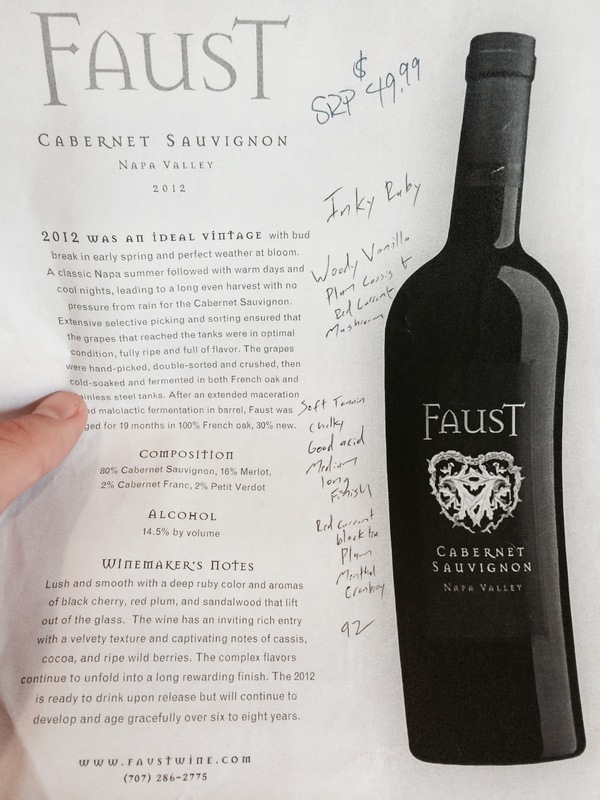 My original tasting notes of the Faust 2012 Napa Valley Cabernet Sauvignon on the original stat sheet sent from Toby in August of 2014. This is a classic Napa Valley Cabernet from a classic vintage. A blend of 80% Cabernet Sauvignon, 16% Merlot, 2% Cabernet Franc, and 2% Petit Verdot. 50% of this fruit came from their Faust Vineyard in the Coombsville District of Napa… the highest blend of their estate fruit they have ever done. This wine was aged for 19 months on French Oak (30% new). The suggested retail price of this Cab is $49.99, and it is available through many of your favorite online wine retailers. Color: An inkier than typical ruby red. Nose: Woody vanilla from the French Oak, though not overpowering. Beautiful fruits of plum and red currant. There is a woodsy mushroom component in the background. Nice. Taste: Soft, chalky tannins (you know I love chalk). Good acidity that leads to a medium long finish. Notes of red currant, black tea, plum, menthol, and cranberry. Beautiful! Score: In a world where most 50 dollar Napa Cabs tend to settle for delivering an oak-garnished fruit bomb, Faust went the extra mile to give the consumer something more. Yes, that fruit is there… but the earthiness and acidity help to present a complete picture. Yes, it’s got oak… but it’s oak with intention. Subtle and soft, this is a wine that drinks well right now, and will continue to do so for at least the next 5 years. 92 points! 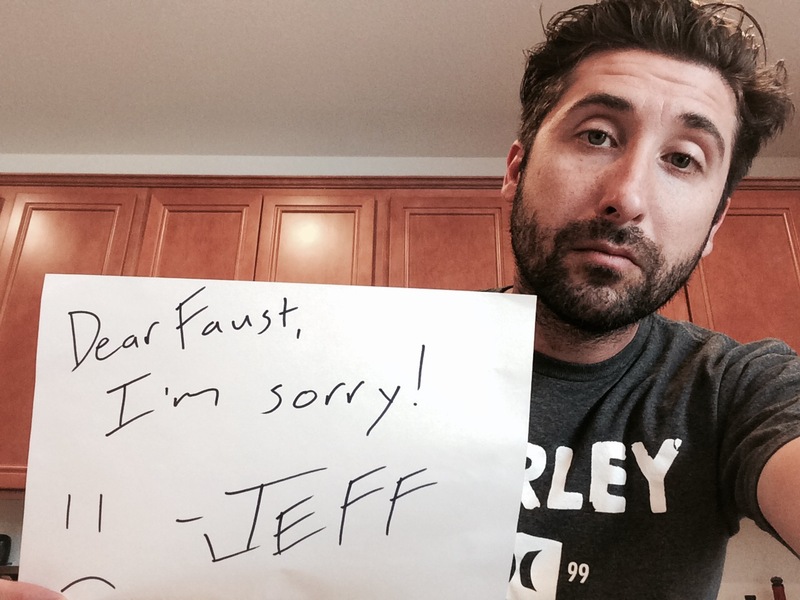 Faust, I want to apologize to you and Toby for having to wait this long for a review of your wine on this blog. I dropped the ball, and was completely unprofessional. I’m not looking for your forgiveness here, I just want you to know how truly sorry I am. No question for this post, just please make sure to check out this wine at www.FaustWine.com. This entry was posted on June 30, 2015 at 1:46 pm and is filed under Wine. You can follow any responses to this entry through the RSS 2.0 feed. You can leave a response, or trackback from your own site. Solomon’s are always RIGHT( or wrong?). No argument!!! I think your blog is the BEST, no ifs, ands or buts!!! To a Solomon from a Solomon. Jeff, as penance, your next review is Tenafly Viper. Man, I loved that movie. If only, Evan… If only. Excuse me… I thought my dad’s name was Marcello.